DONOVAN was here over Labor Day Weekend. He played two concerts Sunday night during Fairfest 2016, Fairfield, Iowa’s Roots Music Festival. The first was a fundraiser for Maharishi University’s Global Scholarship Fund at the Fairfield Arts & Convention Center‘s Stephen Sondheim Center for the Performing Arts, and the second was with Bonnie Paine and friends to close out the 3-day musical event on the Main Stage outside. Donovan had never played back-to-back performances like that, but it turned out very well. 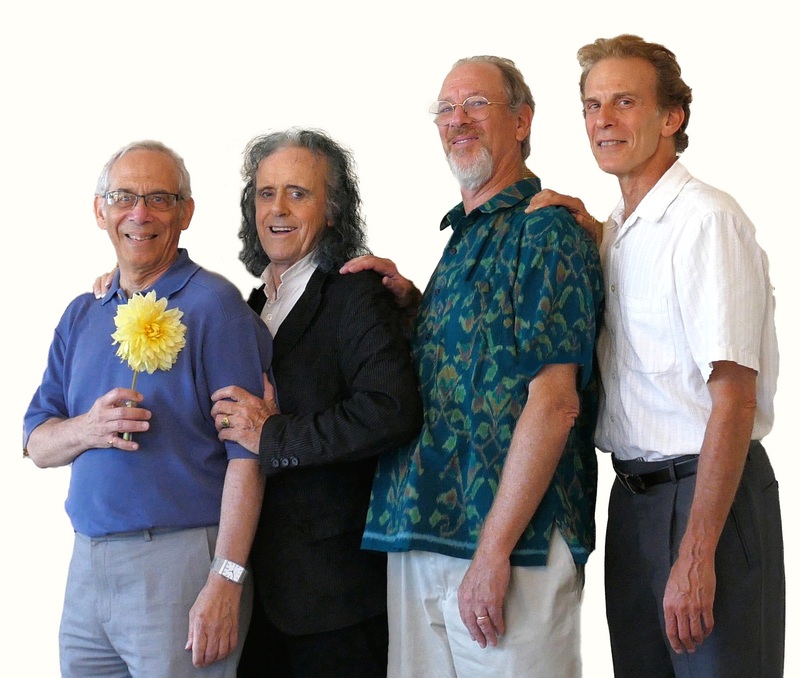 After arriving and having lunch, Donovan met the band at the Sondheim theater and went to work rehearsing with them. It was impressive! They consisted of Elephant Revival’s singer Bonnie Paine (percussion), and two from her group, top to bottom: Daniel Rodriguez (guitar, banjo) and Dango Rose (bass), joined by Arthur Lee Land of Great American Taxi (guitar), and Tim Carbone of Railroad Earth (violin, organ). The MUM concert in the Sondheim was special and intimate, filled mostly with meditators. Donovan then joined the band on the Main Stage after their performance. In both the rehearsal and the concert, Donovan encouraged each one of the musicians playing his songs. They all really enjoyed themselves, as did the audience, and drew the largest crowd of the 3-day event! See video clips below. After the concert, Donovan invited them back to his Green Room to share stories about the music business. What a magical treat for them all!!! Producer Michael Sternfeld took the group photo, choreographed by Donovan. New addition: Donovan Presentation–LA City Council Meeting. 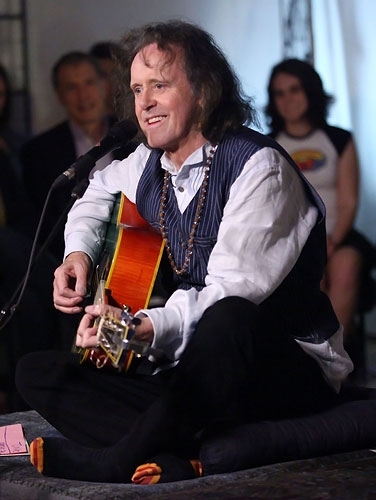 Donovan left Fairfield early Tuesday morning to continue the American wing of his “Sunshine Superman” Tour, which was unofficially launched at East Hampton, Donovan: Flower-Power Icon of Change, then officially on Good Day LA, which discussed Donovan Day in LA. That night he performed on Jimmy Kimmel Live, who said Donovan’s tour was starting in Fairfield, Iowa! After his performance, Jimmy whispered in Donovan’s ear that his interview with Howard Stern was the best ever. Fox News Video also posted this clip: Donovan shows no sign of slowing down. Billboard later published: Donovan Reflects on ‘Sunshine Superman’ 50th Anniversary, Hanging With The Beatles & Jimmy Page, Flower-Power Era. And then this news, which is so appropriate: Donovan to Be Honored With John Lennon Real Love Award at Tribute Concert. “Donovan is a beautiful soul who was positively influenced by John,” Yoko Ono said in a statement. Read how this came about in this fascinating billboard article. It’s interesting that Donovan will receive this award in John Lennon’s name. Donovan also had a positive influence on John when the Beatles were with Maharishi in India. John had asked Donovan to show him how he played his guitar. Donovan said it was the claw hammer style he had learned from another musician. It was based on a banjo-picking style converted to guitar. In a way, it came full circle for John, since his mother, Julia, had taught him how to play chords on a banjo she had given him before he picked up the guitar. John wrote Julia and Dear Prudence using that style. Paul picked it up his way and wrote Mother Nature’s Child and Black Bird. George Harrison said Donovan was all over The Beatles White Album. Donovan mentions all this and more in a Rolling Stone interview (April 19, 2012) after he was inducted into the Rock and Roll Hall of Fame. Watch the video: Donovan: On teaching guitar technique to Beatles. Some regional articles came out to promote the event. The Iowa Source published an article by Michael Sternfeld: Donovan: Sunshine Superman. Michael Braunstein wrote a very interesting article for The Reader in Omaha. Musician and journalist Bob Saar, who has covered David Lynch Weekends and MUM Commencements, wrote a great article for The Hawk Eye: Donovan to perform at FAIRfest 2016. Iowa City’s Little Village’s Arts Editor Genevieve Heinrich published: Musician Donovan Leitch talks legacy of ‘Sunshine Superman’ and importance of Transcendental Meditation, and showed up for the concert with her family. Mark Newman from the Ottumwa Courier dropped by during rehearsal: Donovan performance mends Fairfield hearts. Mark surprised me with a mention, helping Donovan set up. Werner Elmker posted this photo of Donovan from the solo concert, and these Fairfest 2016 Highlights of Day One, Day Two, and Day Three, which contains excerpts from Donovan’s Sondheim and Main Stage concerts. Professional photographer Kim Green came down from Cedar Rapids and posted a slideshow: Fairfest ~ Labor Day weekend 2016 – Prairie Moon Media- An eclectic mix. Andy Hayward posted clips from both shows of Donovan at FAIRfest ’16. A Labor Day lunch was hosted by Mayor Ed and Vicki Malloy. Some guests brought their Donovan records and posters for him to sign, and took pictures. In attendance were Bevan Morris, John and Kara Hagelin, and other leading members of the Fairfield/MUM community. After lunch, Donovan regaled us with stories from Rishikesh, India at Maharishi’s ashram with the Beatles, Mike Love, Prudence Farrow, and others. He told us stories of his times with Maharishi, and a vivid dream he had of him, a week before coming here for the America wing of his 50th anniversary tour. Donovan then asked me to share the story of what Maharishi had said about him. When I was with Maharishi at Lake Louise, one of my course mates had asked Maharishi about George Harrison and Donovan. About Donovan, Maharishi said he was the most sensitive boy he had ever met. Carpenter asked him about composing, performing, his phenomenal success, and his very recent meeting with Maharishi who had taught him how to meditate. He describes that experience towards the end of Part 2: You just spent three days with Maharishi in Los Angeles. What’s he like? Read more posts on Donovan here. If you can, see him in concert this time around. Check Donovan’s website for a list of concert dates and locations. I must say, of all the times I’ve interacted with Donovan over the years, I found him to be most generous and patient with his time and energy while interacting with everyone. Not much ego there, but a very sensitive loving soul, who was kissed by the lord and filled with song to wear his love like heaven. He truly is an evolved Hurdy Gurdy Man, a gift of a rare flower to our garden! Looking forward to seeing him in Fairfield again, next time with his lovely wife Linda. Update (March 7, 2019): Last year, January 11, 2018, Donovan sent us a link to his interview with Mike Greenblatt for Goldmine Magazine, which had come out the day before: Donovan: Psychedelia’s Poet Laureate. In it he tells the story of how he met the Beatles, shared songwriting with Paul, his spiritual friendship with George, his learning TM from Maharishi, and their trip to India to learn more. And the rest is history, our history! On November 28, 2007, Maharishi Mahesh Yogi, founder of the Transcendental Meditation technique, was featured in a biographical documentary on the International History Channel. ITN Factual, a UK-based production company, was commissioned by A&E to produce it. During an interview with the folks at TMhome I had mentioned it, but they wanted to save it for a second article by itself. That article was published this week along with the complete film, which aired 8 years ago this coming weekend. Some of you may have seen it, or heard about it but never got see it. Well, now you can. Previously unseen historical footage of Maharishi had been located and edited segments were provided to the producer/director Fiona Procter. Some of the people I had arranged to be interviewed for the film were David Lynch, Donovan, Mike Love, Bob Roth, Theresa Olson, Alan Waite, Bevan Morris, and John Hagelin. Jerry Jarvis was included when the producer was in Los Angeles. Sally Peden was also interviewed for the film but did not make final cut. However, she provided additional valuable information for the producer to better understand and appreciate the scope of Maharishi’s contribution to the world. Parts of that interview were transcribed and included in the article on how the film came to be made. Read the complete article and watch the film on the TMhome website: International History Channel documentary on Maharishi Mahesh Yogi: How it was made: The story behind the film. The film is also posted on The Uncarved Blog. A documentary that was filmed partially in Fairfield will make its Iowa debut at 7 p.m. Sunday at the Steven Sondheim Center for the Performing Arts. The film, “Rooted in Peace,” is a product of Greg Reitman, founder of Blue Water Entertainment, Inc. In a press release, Reitman said the film challenges viewers to examine their values as Americans and human beings. Reitman interviewed numerous celebrities for the film such as author Deepak Chopra, film director David Lynch, musicians Donovan, Mike Love and Pete Seeger, media mogul Ted Turner, Archbishop Desmond Tutu and more. He also interviewed Fred Travis, professor of Maharishi Vedic Science at Maharishi University of Management. 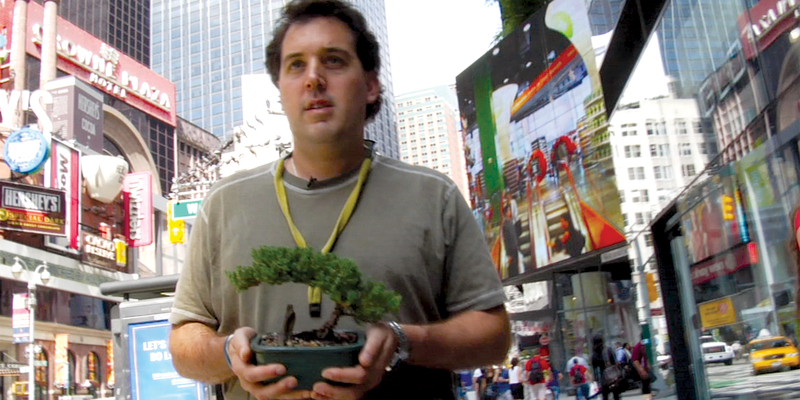 The press release states that Reitman learned kernels of wisdom from all those he interviewed. “Reitman’s journey is an example of transformation — how one person can learn to make the necessary changes to enjoy a better life — and in so doing inspire others to want to improve their own lives, and society as a whole,” reads the press release. After that, he started thinking about doing a film about all the violence in the world. An experience at JFK Airport in New York City opened his eyes to a whole new world. Reitman got in touch with Ken Chawkin, who was then the public relations officer at MUM. Chawkin encouraged him to visit Fairfield, and mentioned that the Beach Boys were going to be in town for a concert. Reitman’s wife is from Iowa, so the two decided to attend the concert. Reitman came back a second time with Donovan for the David Lynch Film Weekend. During his second trip to Fairfield, he interviewed Donovan, David Lynch and Bob Roth. After the film, Reitman will hold a question-and-answer session with the audience. One of the common questions Reitman has received in his other Q and As is, “Why did the film take so long to make?” The film took five years in all, which Reitman said is not too far out of the ordinary for documentaries. Reitman said he greatly enjoyed his time in Fairfield. It reminded him of another small town he filmed in, Carbondale, Colorado, with a population of just over 6,000. Part of the film is autobiographical, where Reitman shares his person story of living in Israel and visiting Hiroshima, Japan. That said, he feels it’s more an inspirational film than a dry, descriptive documentary. This three-column cover story with large photo carries over to a page 7 three-column section with two photos, one of Greg Reitman with Donovan playing guitar, the other of Mike Love singing on stage from the Beach Boys concert. This article is republished here with permission from The Fairfield Ledger. Click FF Ledger Documentary 7-31-2015 to see a PDF of the whole 2-page article with photos. See other news about the film here. More screenings are coming up this summer for Hollywood director Greg Reitman’s documentary feature film. This month, Martha’s Vineyard Film Society will present ROOTED in PEACE on Wednesday, July 15, 2015, at 7:30pm. There will be a special post-screening Q&A with director Greg Reitman. Read this interesting interview with Zip Creative’s Joanne Zippel on her blog: Fast Forward Friday with Greg Reitman, published today in advance of the MVFS showing. In early August the film will premiere in Fairfield, Iowa. Read how this Hollywood filmmaker came to Fairfield for a Beach Boys concert, returned for a David Lynch Weekend at MUM, learned TM and more, in the July issue of the Iowa Source in their All About FAIRFIELD section: Getting Rooted In Peace: Green Producer Greg Reitman Brings New Documentary to Sondheim for Iowa Premiere. Here is a PDF of the print version. Included in the film are interviews from those visits with filmmaker David Lynch; musicians Donovan and Mike Love; Bob Roth, executive director of the David Lynch Foundation; and Fred Travis, director of Maharishi University’s Center for Brain, Consciousness, and Cognition; as well as historical footage of Maharishi Mahesh Yogi, founder of the Transcendental Meditation® technique, and Maharishi University of Management. Blue Water Entertainment and the David Lynch Foundation are presenting the Iowa premiere of this inspirational documentary feature film, Sunday, August 2nd at 7pm in the Sondheim Center for the Performing Arts. There will be a Q&A following the showing with Sundance award-winning Director Greg Reitman and Executive Producer Joanna Plafsky. Joanna is an established international film producer and distributor, and member of the DLF Board of Directors. Visit the Fairfield Arts and Convention Center website to find out more about Greg and his film, including production stills and the movie trailer, and if you’ll be in town at that time, to purchase tickets. Here is a PDF of the ROOTED in PEACE poster for Fairfield with affordable ticket prices. The Fairfield Weekly Reader will publish an article on the event July 23rd. Previous posts about the film can be seen here. Arrangements are being finalized for the first international premiere, to be announced in the next film post. UMass Amherst alum Greg Reitman (’93) presents a personal journey of discovery, seeking answers to humanity’s self-destructive cycles of waste, war, and violence in this fascinating documentary. Seeking counsel from famous luminaries and activists, the film asks us how we want to live on this planet and challenges us to examine our own values. This 2015 documentary film premiered at the 21st Annual Sedona International Film Festival, February 21–March 1, 2015. 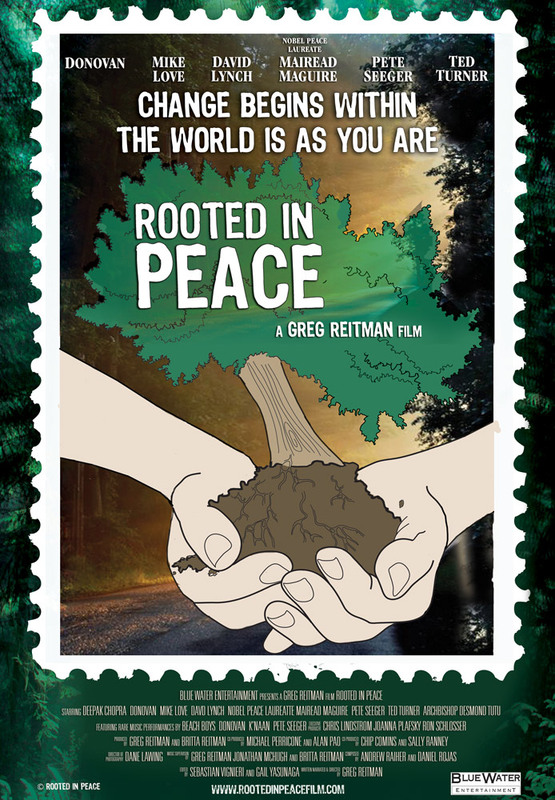 See previous blog post on this Sundance Alum: Greg Reitman’s film, ROOTED in PEACE, inspires us to change from within to transform the world. See the trailer. 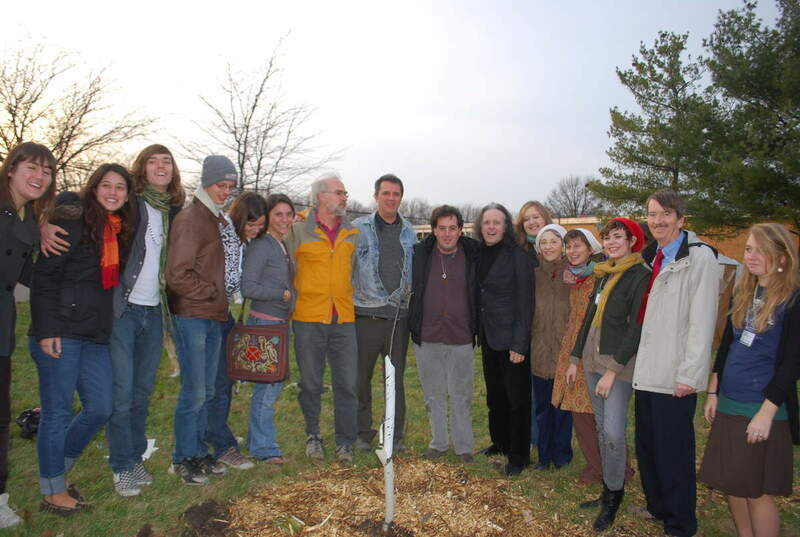 More news: ROOTED in PEACE to play Martha’s Vineyard and an Iowa premiere at Fairfield’s Sondheim Center. Amherst is home to the Transcendentalists, Emerson and Thoreau, and Emily Dickinson. So it seemed fitting for the UMass Amherst campus to be selected as the site for a meditation course and symposium in the summer of 1971. I was one of hundreds who had attended that one-month Transcendental Meditation Teacher Training Course taught by Maharishi Mahesh Yogi. Another course followed on the West Coast at Humboldt State College, now University, in Arcata, California. Over two thousand of us would continue with the next step in our Teacher Training Course with Maharishi the following year in Mallorca, Spain and Fuiggi Fonte, Italy for six months, from January to June, 1972. One of the Amherst course participants was Beach Boy Mike Love. I was introduced to him by Charles Lloyd, a jazz musician on the course who became a friend. I used to give them lifts to and from the dining hall. I would meet Donovan years later, and David Lynch, decades later. You can imagine my surprise when Greg told me he had graduated from UMass Amherst! It was great to arrange for Greg to interview Donovan and Mike Love on how they met Maharishi and learned TM, and David Lynch and Bob Roth, director of the David Lynch Foundation, about the transformational value of TM in schools and for at-risk populations. Small world! Full circle! Wednesday, March 25th, tomorrow night’s showing of ROOTED IN PEACE, should be fulfilling for Greg, as he brings it all back home. He’s worked hard on this film and deserves all the kudos for manifesting this vision of personal and global transformation. Following the course was the First International Symposium on the Science of Creative Intelligence. Maharishi interacted with many leading scientists and thinkers in all areas of life, including Buckminster Fuller. His presentations were so impressive that Maharishi kept interjecting his Vedic perspective in agreement. At a certain point, Fuller turned towards Maharishi and spoke only to him since he felt he was the only one who truly understood what he was saying. At the end he went over to Maharishi who had stood up to greet him and they held hands together. Everyone rose on their feet and applauded for a good ten to fifteen minutes. Those were very heady days! There also was a special press conference with both Fuller and Maharishi following his talk. It’s posted on the Maharishi Mahesh Yogi Channel in 3 parts. I’ll post links here. Very much worth watching! Watch a CBC film of Maharishi at Lake Louise, and a later A&E biography. I tweeted Greg Reitman today about last night’s showing of ROOTED in PEACE and he replied: Full house, engaged audience, lots of questions afterwards … Yes lots of people wanted to buy the DVD which will be available in the fall … That would be the plan and will have 20 minutes of extra scenes on the DVD. … Replying to a tweet I sent out a few days later about the film, Greg replied: It was a real homecoming I was truly surprised how the students responded and for some there were tears. Howard tells Donovan that he’s going to be inducted into the Songwriters Hall of Fame before he even knew, and today it’s news: Donovan, Kinks’ Ray Davies lead Songwriters Hall inductees. 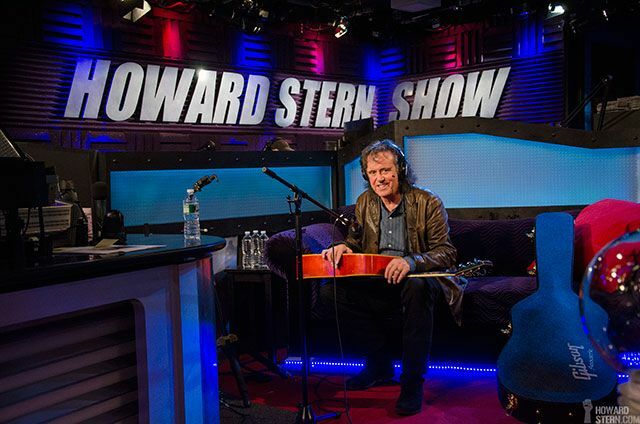 Check this description of the interview on the Howard Stern Show – SONG BY SONG WITH DONOVAN. Around 40 minutes into the interview Donovan talks about how they got into meditation. Some fascinating stories! From the very beginning Prudence Farrow Bruns recognized an added layer or texture to her life, a spiritual dimension that would take her deep within. She was among the first in the West to become initiated into Transcendental Meditation and in the mid sixties she traveled to Rishikesh, India to learn to become a TM teacher. Her own teacher in India, Maharishi Mahesh Yogi who is credited for bringing TM to the world. 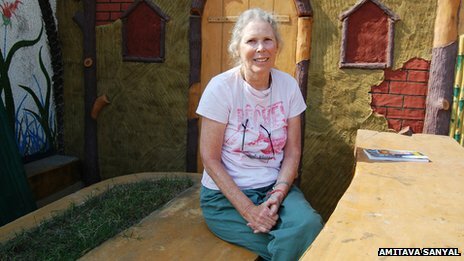 In India with her at this time, her sister and acclaimed actress, Mia Farrow, The Beatles, Mike Love of the Beach Boys, Donovan and others. Prudence and her husband, Albert Bruns who is also a TM instructor, live in Seagrove along the Gulf of Mexico in Northwest Florida. The interview was recorded in Seagrove, Florida in May, 2013. 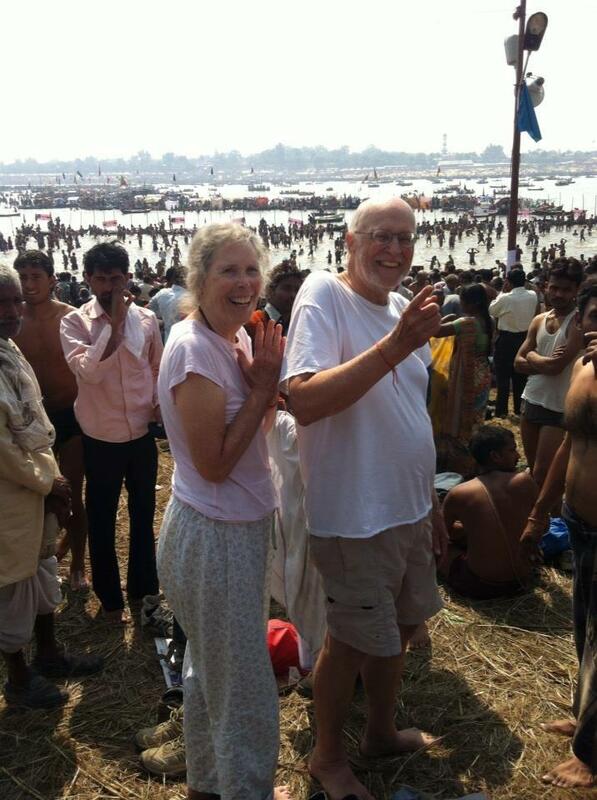 See this related BBC news item: Prudence Farrow — subject of the Beatles song Dear Prudence — visits India’s Kumbh Mela. And this video: The Beatles “Dear Prudence”: A Portrait of Prudence Farrow Bruns, Maharishi and TM. Who was Dear Prudence the Beatles sang to in India? What happened to her? Here is her story. 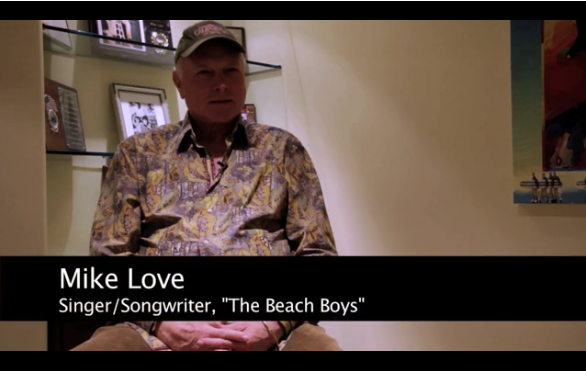 Here’s a good Interview With Mike Love of the Beach Boys posted May 29, 2012 on Stories of Success. He discusses how the band was formed, his creative output as a singer/songwriter, their stages of success, the impact of drugs and alcohol on their lives and careers, and more. At about the 9:55 mark, Mike is asked the question of what kept him from getting caught up in drugs and alcohol, and the responsibility he had of acting as a role model. He answers by talking about his TM practice, how he was personally instructed by Maharishi Mahesh Yogi and later invited to join The Beatles and Donovan in Rishikesh. He continued with a discussion on karma and the results of our actions, why people choose to abuse drink and drugs and how different people react, finding one’s dharma or what you’re meant to do and enjoy doing the most, and persevering to fulfill your chosen career path. The video is posted on Vimeo: http://vimeo.com/43009744. See this great article, Mike Love, Not War, written by Virginia McEvilley for the Iowa Source when The Beach Boys came to Fairfield, Iowa for an outdoor Labor Day concert, sponsored by the David Lynch Foundation, on Monday, September 7, 2009. Related stories: Beach Boys’ Mike Love recharges at The Raj, Beach Boy found life saving cure in Fairfield, Beach Boys concert ‘fun, fun, fun’ for all, Q & A with Mike Love, and Maharishi Mahesh Yogi on History International Channel (November 2007).